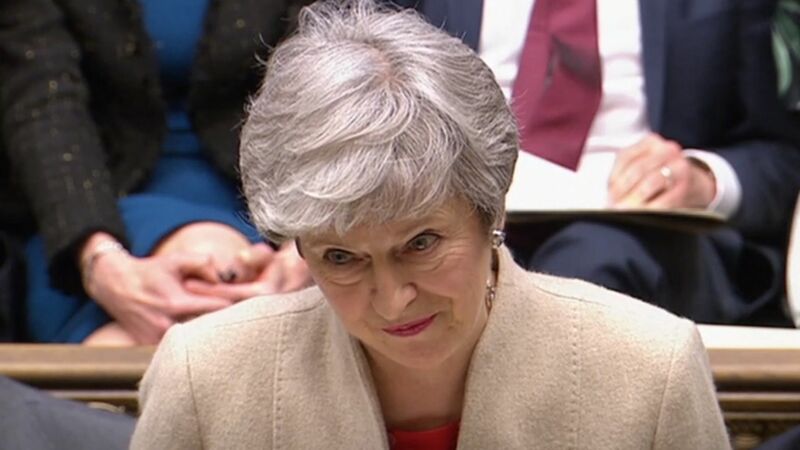 U.K. Prime Minister Theresa May saw her maligned Brexit deal hit with a third defeat in the House of Commons on Friday in a 344-286 vote. Why it matters: It means that big changes may be coming to the British political sphere over the next few days, like the announcement of an early general election, as only way that the EU might grant another long-term extension — the U.K. is currently set to leave the bloc on April 12 — would be through some form of significant political upheaval. Otherwise, the U.K. would be forced into a no-deal Brexit. The state of play: This vote was a little different than the last two. It split the deal's two components — the withdrawal agreement, a legal document setting out the terms of Brexit, and the political declaration, a roadmap for the future EU-U.K. relationship — for a vote only on the withdrawal agreement. Had the vote been successful, it would have lengthened the EU's Brexit extension from April 12 to May 22, giving the U.K. more breathing room before leaving to avoid having to take part in European elections on May 23.